Vedantu.com - No.1 online tutoring company in India provides you Free PDF download of NCERT Solutions for Class 11 Chemistry Chapter 11 - The p-Block Elements solved by Expert Teachers as per NCERT (CBSE) Book guidelines. All Chapter 11 - The p-Block Elements Exercise Questions with Solutions to help you to revise complete Syllabus and Score More marks. Register for online coaching for IIT JEE (Mains & Advanced), NEET, Engineering and Medical entrance exams. NCERT Grade 11 Chemistry Chapter 11, The p-block elements deals with elements of the p-block of the modern periodic table. The variation in properties of the p-block elements due to the influence of d and f electrons in the inner core of the heavier elements makes their chemistry interesting. After studying this chapter, students will be able to appreciate the general trends in the chemistry of p-block elements; describe the trends in physical and chemical properties of group 13 and 14 elements; explain anomalous behaviour of boron and carbon; describe allotropic forms of carbon; know the chemistry of some important compounds of boron, carbon and silicon; list the important uses of group 13 and 14 elements and their compounds. Concepts such as Group 13 Elements: The Boron Family, Atomic Radii, Ionization Enthalpy, Electronegativity, Physical Properties, Chemical Properties, Important Trends and Anomalous Properties of Boron, Some Important Compounds of Boron, Borax, Orthoboric acid, Diborane, B2H6, Uses of Boron and Aluminium and their Compounds, Group 14 Elements: The Carbon Family, Electronic Configuration, Covalent Radius, Ionization Enthalpy, Electronegativity, Physical Properties, Chemical Properties, Important Trends and Anomalous Behaviour of Carbon, Allotropes of Carbon, Diamond, Graphite, Fullerenes, Uses Of Carbon, Some Important Compounds of Carbon And Silicon, Carbon Monoxide, Carbon Dioxide, Silicon Dioxide, SiO2, Silicones, Silicates and Zeolites will be studied in detail through this chapter with the help of diagrammatic representations, graphical formats and equations. NCERT Grade 11 Chemistry Chapter 11, The p-block elements is a part of Unit 11. Unit 8, Unit 9, Unit 10 and Unit 11 in combination; hold a weightage of 16 marks in the final examination. Get 100 percent accurate NCERT Solutions for Class 11 Chemistry Chapter 11 (The p-Block Elements) solved by expert Chemistry teachers. We provide solutions for questions given in Class 11 Chemistry text-book as per CBSE Board guidelines from the latest NCERT book for Class 11 Chemistry. The topics and sub-topics in Chapter 11 The p-Block Elements are given below. Chapter 11 - 38 Questions with Solutions. Other than given exercises, you should also practice all the solved examples given in the book to clear your concepts on The p-Block Elements. 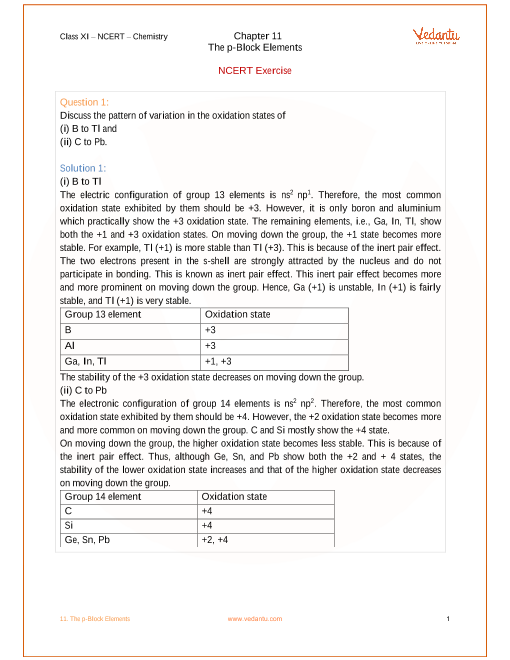 Download the free PDF of Chapter 11 The p-Block Elements and take the print out to keep it handy for your exam preparation.